Researchers at Sandia National Laboratories' Combustion Research Facility are part of an international team that has detected a new class of compounds previously unknown in flames, a breakthrough that could lead to soot reduction, decreases in flame pollutants, improved fuel cells, and enhanced modeling of planetary atmospheres and interstellar chemistry. A cover story on the discovery is scheduled to appear in the June 24 edition of Science magazine. The discovery of these compounds, called enols, is the biggest breakthrough so far from a powerful new flame chemistry probe, operated at the Advanced Light Source at Lawrence Berkeley National Laboratory (LBNL), that was developed by researchers from Sandia, LBNL, Cornell University, and the University of Massachusetts in late 2002. 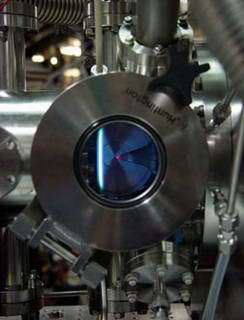 This machine, and a similar device operating at the National Synchrotron Radiation Laboratory in Hefei, China, investigates molecules sampled from flames by combining mass spectrometry (to reveal molecular weight) with ionization by vacuum-ultraviolet light emitted from a synchrotron. One key capability of the machines is that they are able to distinguish isomers — molecules made of the same atoms but in different arrangements — that can have very different chemical characteristics. Enols are less-stable isomers of other well-known combustion intermediates. They were found when the team was looking for signatures of different isomers in flames. With this finding, enols can be added to predictive computer models currently used to improve combustion efficiency and cleanliness. The unanticipated detection of enols could also have a significant impact in refining models used to describe fuel cell operation and emission-free waste cleanup using supercritical water oxidation, said Taatjes. Astronomers have also observed ethenol (one of the enol compounds now identified in flames) in interstellar space. The new enol findings may provide clues as to how complex organic molecules form in interstellar space. Besides the Sandia scientists, the team that discovered enols in flames includes researchers from Cornell University, the University of Massachusetts, the University of Bielefeld (Germany), and the National Synchrotron Radiation Laboratory in Hefei, China.